The four Ms of e-learning will help you make your courses as successful as possible. Think of each of them like a pillar – when you have all four in place, the structure will be much more stable. Michael Allen talks about the Ms in his book Designing Successful E-Learning. For us at Capytech, they provide a direction for the design and creative process, ensuring the focus always remains on the objective of the course. 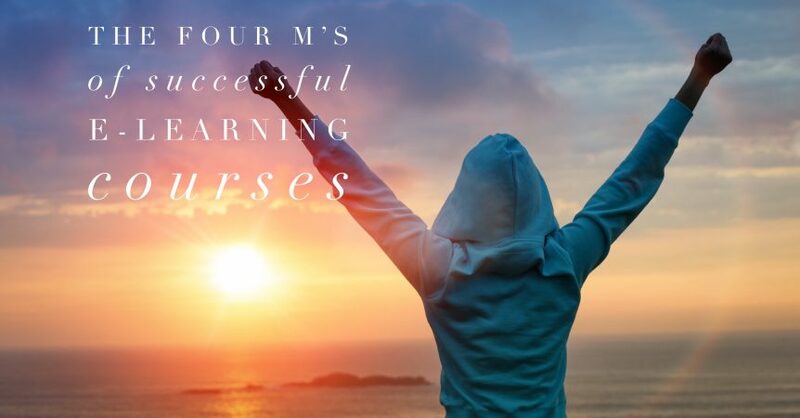 In other words, the four Ms help you make e-learning courses successful. Let’s look at each in more detail. Some organisations look at meaningfulness from the perspective of the organisation – why the e-learning course is meaningful to the business. Of course, this is important to understand, but this blog is about making your e-learning course successful. That means you must make the course meaningful to the learner too. What does this mean? Firstly, the e-learning course should make sense to the learner and they should understand why they are doing it. For example, the course could be to enhance existing skills. Alternatively, the course might give the learner new skills they can use to improve their performance and/or productivity. In addition, the e-learning course must have an outcome or objective the learner understands. That said, making an e-learning course meaningful to all learners can be challenging. This particularly applies when different types of learner do the course – people with different job roles, people with differing skillsets, etc. These are challenges you must overcome, however. One of the ways you can do this is ensuring you get the context of the course right. You can also personalise the learning experience and you should also ensure the content is as directly relatable to the learner as possible. For almost all e-learning courses, your objective should not be to get the learner to complete the course. Being able to successfully complete a quiz at the end of the course is not usually enough either. This is because it is important the learner is able to put the new skills and knowledge they have learned to practical use. This requires knowledge retention over the long-term. To achieve this, your e-learning courses – and the content they contain – must be memorable. You can do this by having well-designed and structured content. It is also important to vary the content types as well as including modules and elements that stand out – videos, scenarios, etc. Educational and training techniques like spaced repetition also help, while understanding how adults learn is essential. Other strategies you can use to make e-learning content memorable includes micro learning course design as well as building a library of e-learning courses. The latter facilitates just-in-time learning, an approach that achieves high retention rates because of the high levels of motivation learners have when they do the course. Sticking with the motivation theme, the best e-learning courses fully engage learners. The only way you can achieve this engagement is by motivating the learner to learn. If this motivation does not exist, the learner will just go through the motions. You can achieve this by explaining clearly the benefits of completing the course. For example, how will the e-learning course make the learner more productive and how will the learner become better at their job? You can also explain the benefits to the company but when doing so, always link this back to the learner as much as possible. This M links the other three, allowing you to work out return on investment as well as helping you improve future e-learning courses. In the early stages, measuring results helps you tailor and personalise the learner experience either through automated or manual processes. The later stages help you understand the impact the e-learning has had on your business. In addition, you can improve future courses if you identify modules or elements that didn’t achieve the desired result. As you can see from the above, developing a successful e-learning course and ensuring you have all four M pillars in place is not easy. The four Ms also demonstrate how e-learning is about much more than the technical skills required to put the course together. Instead, you need training and instructional design skills which often means outsourcing e-learning development.